Normally $14.00, on sale for $10.50 ($3.50 savings). Our 20oz. Emma square jar is a perfect size your moderate size candle needs. This candle features a black and gold foil label with embosed raised lettering and accents. This candle has two wicks and the average burn time is 120 hours. Country Clothesline (Wedgewood Blue)- The overall impression is freshly cleaned linens and sheets, lined dried in the mountain air. The clean, comforting aroma will surely remind you of cuddling up with that favorite, fresh off the clothesline blanket in front of the TV or with your favorite book on a cool night. Jungle Gardenia (Petal White)- Gardenia's are typically the strongest flower that is grown and this gardenia is true to it's namesake. This is a wonderful true strong gardenia scent. 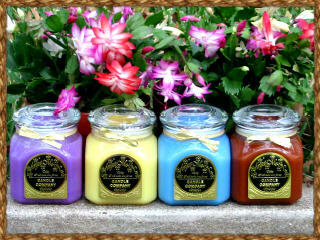 It is sure to fill any home with a terrific lasting fragrance! Tropical Rain (Aqua Mist)- The slow and steady tropical rain, coming down on your Lanai as you sip your Mai Tai in your swinging hammock. The paradise captured in this fragrance has luscious Guava, Papaya and Pineapple followed by the crisp clean floral notes of a rain shower. This is a wonderful fragrance to take you away to the Islands.